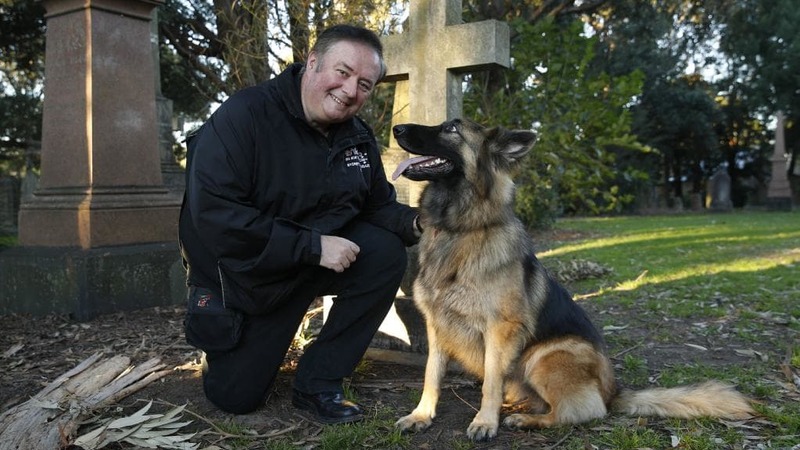 Hera, the Ghost Guard dog, and her human - photo courtesy of The North Shore Times . She is named after the wife of the Chief of the Greek Gods, Zeus. As a Long Stock Coat German shepherd, she needs regular care to be at her best. She is always impeccably groomed before she meets her guests..
Hera is incredibly smart. She is a loving, happy go lucky, playful, amiable and very friendly dog. With the rare exception of when someone deliberately acts in a threatening and unpleasant manner. Then, the instincts that German Shepherds are world famous for, come into effect. In the wrong circumstances, Hera is a fiercely protective "Daddy's girl" who is incredibly effective at removing drunken teenagers out of cemeteries, and making people of ill intent evacuate the premises. Her incredibly keen night vision ( on par with a cat) , sense of hearing which is 5 times better than human hearing, and a nose keen enough to know when a barbecue has been lit three suburbs away, ( 5000x better than human) help keep all of our ghost tour participants safe. Congratulations to Peter Wilson of Cremorne - who has won a group ghost tour gift certificate, and a dinner to the value of $400.00 at any one of the Cammeray Miller Street restaurants - your prize is in your email inbox!